Since 1949, Yarmouth Lions Club members have been devoted to helping improve the quality of life for our neighbors and our town. The Yarmouth Lions Club serves through regular volunteerism, and by raising money to provide financial assistance to the dozens of local aid organizations, neighbors in need, and to support the maintenance, beautification, and safety of Yarmouth, Maine public spaces. In addition, the Yarmouth Lions Club volunteers and financially supports our local food pantry, the Yarmouth Community Garden, the Merrill Memorial Library, YCAN, the Iris Network, YMCA, multiple Eagle Scout projects, the Yarmouth Little League team, and many more community initiatives. 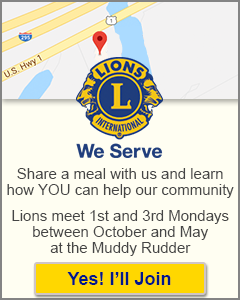 The Yarmouth Lions Club meets every 1st and 3rd Monday, from October through May, at the Muddy Rudder restaurant. Our social gathering begins at 5:00pm, and Club business starts at 5:30pm. We also meet the 3rd Monday in September, and meet once in January and once in February.